My Ten Best Kitchen Styling Tips. I have photographed and styled scores of kitchens for firms like Sub-Zero, KitchenAid and Wood-Mode. Here are the latest trends for styling kitchens in magazines. Keep it simple. In these times less is more. Select a color palette for the accents, go for a tone on tone look. Prop with bigger scaled items than normal; maybe using a big open cookbook for scale. Be constant. Do not have props move about in the different photos. Keep it real. Keep it natural. Go farm to kitchen! Do not set the table or counter; it might feel too stuffy. Leave some empty areas and show some negative space. 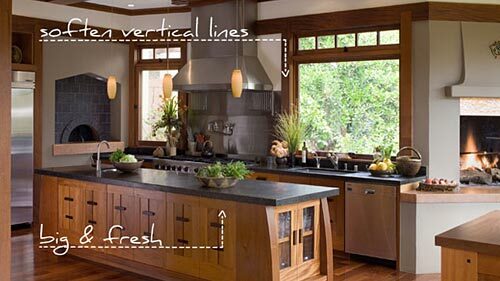 Use vertical objects to break strong horizontals lines. Be clean and tidy. Want more info? To get more detailed tips from a pro, contact me to see when the next Styling Workshop is scheduled. As an interior photographer, I shoot kitchens throughout the San Francisco Bay Area and California.